is a voluntary, youth and educational organisation open to all regardless of their origin, race or creed. It is based on the priciples of the world Scout Movement and ampasises the ideas of pluralism, freedom of individual, peace, moral, ethical and spiritual values - ideals as written down in the Scout Promise and Law. The promise, which is a promise to himself or herself and to the Scout Movement, is taken by every new member after completing "probation" period. By learning about Nature, living outdoor and experiencing its beauties and challenges as well as its inhospitality, the members of Zveza tabornikov Slovenije look towards themselves and become aware of the inevitable connection and integrity of world. Living in the very heart Nature brings them closer to the meaning of coexistence, spiritualy and their readiness for such life in Nature. Even our slogan "With nature to the Man" ("to Man" in the sense of "to mankind") emphasises the link between Scouting and Nature. The organisation constitutes the educational programmes including the integrity of Nature and Man as its basic objective. Zveza tabornikov Slovenije members encourages the active participation of its members and groups in solving the problems in the joung demokratic society and stresses the importance of tolerance and usnderstanding, It includes bringing the children of refugees into Scout activities, and organising summer camps with them. 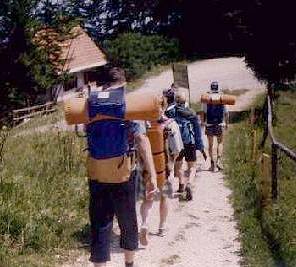 Zveza tabornikov Slovenije was established in 1951 on the heritage of pre-war Scout and Woodcraft movements. Nowadays, it counts 7900 active members organised in patrols, Cub packs, Scout troops and Venture clubs. Thera are 82 Scout grousp in 8 regional Scout organisations. Zveza tabornikov Slovenije is a recognised member of the world Organisation of the Scout Movement since Spetmeber 1994. Work in the organisation is based on membership in small groups under adult guidance, involving progressive discovery and acceptance of responsibility, trainig towards self guidance in a sense of developing peronality, acquisition of competence, self-reliance, dependability and capacities both to co-operate and to lead. Children may enter the Scout organisation in the pre-scool age (Pre Cub Scouts), but they truely experience the Scout life in the primary school (Cub Scouts and Scouts) and middle school age (Venture Scouts). For them a well-organised education and trainig is organized. They become patrol leaders after the patrol leader training courses and seminars, and later as Specialists can help younger Scouts in their scout life. All adults who feel close to Nature and like working with young people are wellcome to stay in the organisation or even join Zveza tabornikov Slovenije later if they are ready to support it.